Solid state transformer (SST) is also known as electronic power transformer or power electronic transformer. An SST can be defined as a type of electric power converter that is used as an AC-to-AC converter in AC electric power distribution and that replaces a conventional transformer. Although a solid state transformer is more complex than a conventional converter, it is more efficient and smaller than the conventional transformer. An SST generally contains a high-frequency transformer inside the DC-to-DC converter or AC-to-AC converter, which transmits power and offers electric isolation. Currently, solid state transformers are increasingly being used in the electrical industry in applications such as alternative power generation, power grids, and traction locomotives. 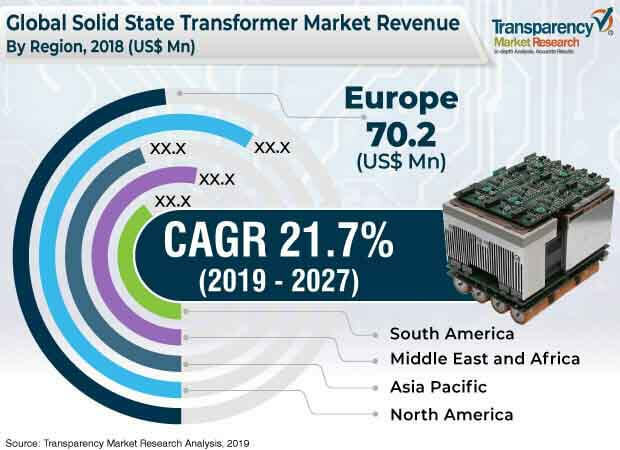 The global solid state transformer market is projected to expand at a CAGR of 22.0% during the forecast period and reach value of US$ 1,950.0 Mn by 2027. Furthermore, increasing number of installations of renewable energy sources and smart grids is projected to drive the global solid state transformer market during the forecast period. Solid state transformers are increasingly being used between a load or distribution grid and a power generation source for energy management. Preference for renewable energy sources, such as tidal, solar, and wind power, has increased in recent years. This would further increase investments in smart grids and renewable energy systems. This, in turn, is anticipated to drive the solid state transformer market during the forecast period. In addition, solid state transformers are used in various offshore energy generation applications, eliminating drawbacks of traditional transformers including sensitivity to harmonics, performance degradation under system disruptions and overload, phase imbalance, power quality issues, and voltage drop under load. Thus, increasing usage of SST in these applications is expected to augment the demand for SST during the forecast period. Increasing number of data centers led by rising demand for supporting infrastructure has become a major trend in the global solid state transformer market. Solid state transformers are increasingly being used in data centers to carry out multiple tasks including maintenance of cooling systems and power conditioning. This is primarily attributable to features of solid state transformers. Solid state transformers offer better control over reactive power, current, and voltage of data center power supply, while reducing power loss. They also eliminate the need for additional devices such as power conditioners. Advantages of solid state transformers help in developing data centers with an optimal design. Furthermore, companies are investing a large portion of their revenues in opening new data centers. For instance, Huawei has announced to build two data centers in South Africa from March 2019 in order to expand cloud services across Africa. Google is expected to invest US$ 13 Bn in building new data centers across the U.S. in 2019. Solid state transformers provide effective isolation between a low-voltage system and a medium-voltage system. However, several issues limit the applicability of these transformers in distribution grids. Solid state transformers are not compatible with protection systems employed in low-voltage grids. Hence, they cannot be used in place of low-frequency transformers. Also, solid state transformers are less efficient than low-frequency transformers, even though their prices are higher. These factors are likely to hamper the global solid state transformer market during the forecast period. With the objective of business expansion, several players are expanding their offerings through strategic mergers and acquisitions as well as partnerships. Furthermore, an increasing number of players are spending significantly on R&D activities to develop innovative and technologically advanced solid state transformers. Some of the prominent players operating in the global solid state transformer market are ABB Ltd., Alstom SA, Amantys Limited, Eaton, General Electric Co., Gridbridge, Inc., Mitsubishi Electric Corporation, Schneider Electric Se, Siemens AG, and Varentec, Inc. This comprehensive report by Transparency Market Research analyzes and forecasts the solid state transformer market at the global and regional levels. The report provides analysis of the market for the period from 2017 to 2027, wherein 2019–2027 is the forecast period and 2018 is the base year. An in-depth and unbiased market assessment has been made to provide readers with comprehensive and accurate analysis. The report emphasizes all major trends anticipated to be witnessed in the global solid state transformer market from 2019 to 2027. It also focuses on market drivers, restraining factors, and opportunities for the global market. The study provides a complete perspective about growth of the solid state transformer market, in terms of value (in US$ Mn), across various geographies including North America, Europe, Asia Pacific, Middle East & Africa (MEA), and South America. The report includes detailed value chain analysis, which provides an extensive view of the global solid state transformer market. Porter’s five forces analysis has also been provided in the report to help understand the competition scenario of the market. The study incorporates market attractiveness analysis, wherein product, component, and application segments have been benchmarked based on their market size, growth rate, and attractiveness. In order to offer complete analysis of the competition scenario of the solid state transformer market, attractiveness analysis of the market in every region has been provided in the report. The market overview chapter explains market trends and dynamics that include drivers, restraining factors, and the current and future opportunities for the global solid state transformer market. Market outlook analysis has also been provided in the report. Additionally, the report provides analysis of different business strategies being adopted by leading players operating in the global solid state transformer market. The market introduction chapter helps in gaining an idea of different trends prevalent in the global solid state transformer market. The study provides a decisive view of the global solid state transformer market, by segmenting the market in terms of product, component, and application. The report provides a detailed, region-wise segmentation of the global solid state transformer market and sub-categorizes it into various countries, thereby providing valuable insights at micro and macro levels. The report further highlights the competition scenario in the global solid state transformer market, thereby ranking all major players according to their geographical presence and key recent developments. Insights for the market is a result of extensive primary interviews, secondary research, and in-house expert panel reviews. Market estimates have been analyzed by considering the impact of different economic, political, social, legal, and technological factors. The solid state transformer market in North America has been segmented into Canada, the U.S., and Rest of North America. Furthermore, the Europe market has been divided into France, Germany, the U.K., and Rest of Europe. The solid state transformer market in Asia Pacific has been classified into China, India, Japan, and Rest of Asia Pacific. Middle East & Africa comprises GCC, South Africa, and Rest of Middle East & Africa. Similarly, South America includes Brazil and Rest of South America. The report provides all strategic information required to understand the global solid state transformer market. The report also offers insights into different product, component, and application segments of the market in various regions mentioned above. Primary research involves telephonic interviews, e-mail interactions, and face-to-face interviews for detailed and unbiased reviews of the solid state transformer market across geographies. Primary interviews are usually conducted on an ongoing basis with market experts and participants in order to obtain the latest market insights and validate the existing data and analysis. Primary interviews offer new information on important factors such as market trends, market size, competition landscape, and growth trends. These factors help validate and strengthen secondary research findings. Moreover, the data collected from secondary and primary research is discussed and examined by TMR’s expert panel. The research study includes profiles of leading companies operating in the global solid state transformer market. Market players have been profiled in terms of attributes such as company overview, financial overview, business strategies, and recent developments. Key players profiled in the report are ABB Ltd., Alstom SA, Amantys Limited, Eaton, General Electric Co., Gridbridge, Inc., Mitsubishi Electric Corporation, Schneider Electric SE, Siemens AG, and Varentec, Inc. Companies are focusing on expanding their business through strategic acquisitions and partnerships.